The following procedures were released under the Freedom of Information Act following a lawsuit from the American Civil Liberties Union (ACLU). 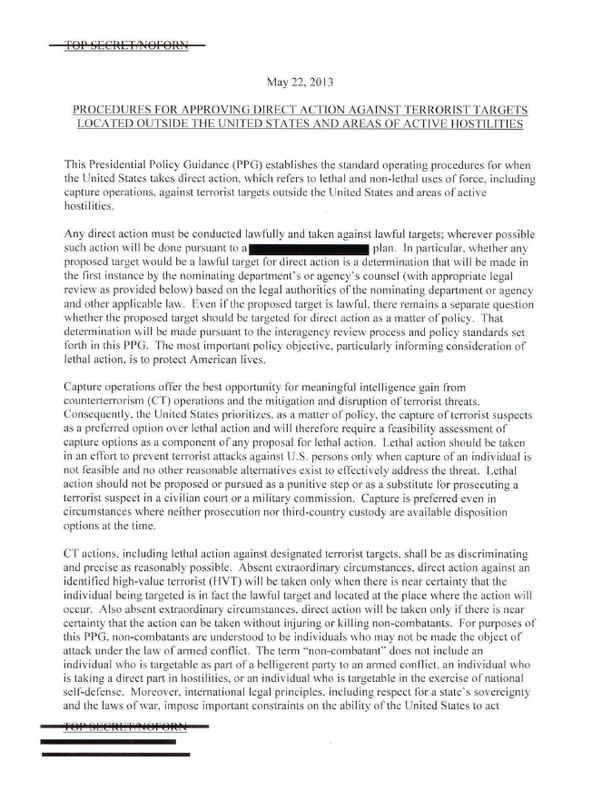 This Presidential Policy Guidance (PPG) establishes the standard operating procedures for when the United States takes direct action, which refers to lethal and non-lethal uses of force, including capture operations, against terrorist targets outside the United States and areas of active hostilities. Capture operations offer the best opportunity for meaningful intelligence gain from counterterrorism (CT) operations and the mitigation and disruption of terrorist threats. Consequently, the United States prioritizes. as a matter of policy. the capture of terrorist suspects as a preferred option over lethal action and will therefore require a feasibility assessment of capture options as a component of any proposal for lethal action. Lethal action should be taken in an effort to prevent terrorist attacks against U.S. persons only when capture of an individual is not feasible and no other reasonable alternatives exist to effectively address the threat. Lethal action should not be proposed or pursued as a punitive step or as a substitute for prosecuting a terrorist suspect in a civilian court or a military commission. Capture is preferred even in circumstances where neither prosecution nor third-country custody are availab le disposition options at the time. CT actions, including lethal action against designated terrorist targets. shall be as discriminating and precise as reasonably possible. Absent extraordinary circumstances, direct action against an identified high-value terrorist (HVT) will be taken only when there is near certainty that the individual being targeted is in fact the lawful target and located at the place where the action will occur. Also absent extraordinary circumstances, direct action will be taken only if there is near certainty that the action can be taken without injuring or killing non-combatants. For purposes of this PPG. non-combatants are understood to be individuals who may not be made the object of attack under the law of armed conflict. The term ·’non-combatant” does not include an individual who is targetable as part of a belligerent party to an armed conflict, an individual who is taking a direct part in hostilities, or an individual who is targetable in the exercise of national self-defense. Moreover, international legal principles. including respect for a state’s sovereignty and the laws of war, impose important constraints on the ability of the United States to act unilaterally-and on the way in which the United States can use force-in foreign territories.